One of the big regional stories in the Daily Advertiser over the past few months has been a construction project on the Hume Highway, the main route that runs between Sydney and Melbourne, the country’s largest cities. 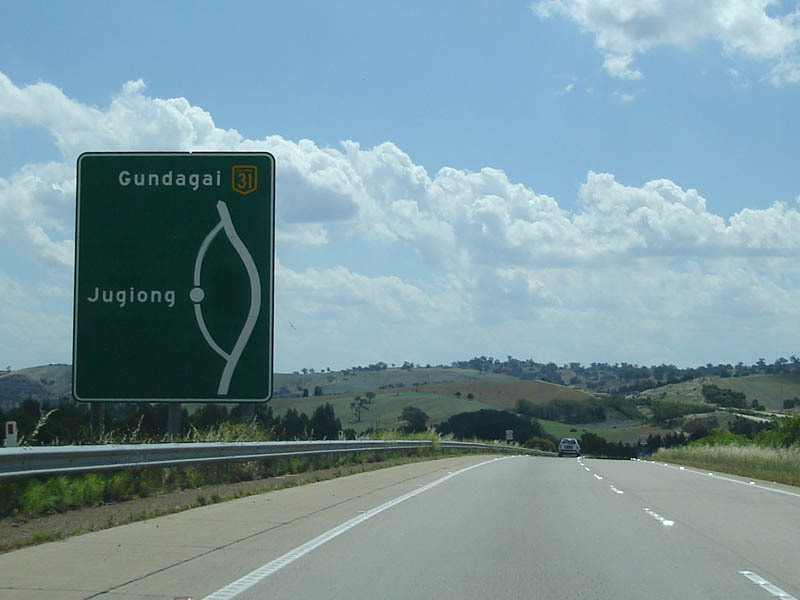 It is about 870 km between these two cities, and just about half way between them is the little town of Tarcutta (about 45 km southeast of Wagga – we’re not on the highway). We went to Tarcutta one day last weekend, after seeing in the Advertiser that Saturday was Tarcutta Market Day. We thought, hey, maybe some fresh veggies, fruit, etc…why not? We like going to the little towns around here, checking out what is there. Sorry we don't actually have any of our own photos of Tarcutta. The camera was in the boot of the car, but it didn't really seem worth getting. 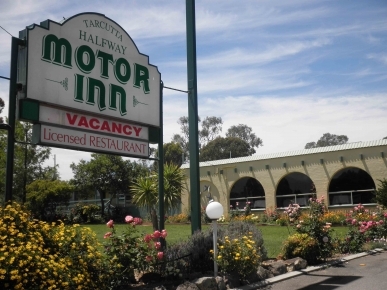 Well, there isn’t much in Tarcutta; it seems that it’s entire existence has been based on the fact that it was a good pit stop for people – mostly truckies – driving this route. There is a huge Caltex petrol station (really huge…) with a variety store, a huge parking lot for transports (basically just a big flat chunk of concrete), a café, an op-shop, a craft shop, a clothing factory outlet, a war memorial and a motel (or two? can’t remember). Since the Halfway will probably never again be full and guests have to sleep in the manger, the second coming won't start here. The reason that the highway construction has been news is that they built a bypass around Tarcutta. So what little they have is probably going to get less. The locals complain that no one comes there now, so businesses are dying. Over Christmas, when a lot of people travel – therefore pit stops do well – business at the Caltex’s fast food outlet was down more than 50 percent from last year. Yikes! So when we went to Tarcutta, we didn’t know what to expect. But our expectations, as low as they were, were far too high. The market…pretty pathetic, really. A few tables of people selling things like knitted baby clothes, a couple tables selling jam, one selling fresh herbs, one with a some pumpkins and squash, and a couple more selling commercial flea-market style crap and lucky dips. And a sausage sizzle, of course…it isn’t a market without one. We went in, looked quickly, and left, feeling kind of bad that we weren’t doing something to help their economic woes but we just couldn’t see anything worth buying. A town can't survive on the occasional pickle sale, even if they are good pickles (as these ones are). 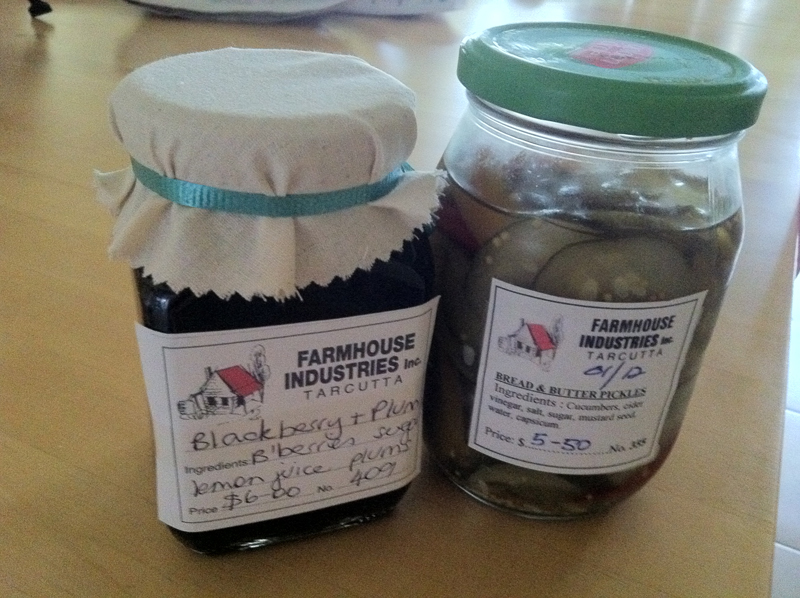 Haven't tried the jam yet, but how bad can blackberry and plum jam be! The date loaf didn't last long enough to be photographed, which is too bad because it was kind of interesting. It may have been cooked in an old tin can. We did go to the craft shop across the street, which had similar but better things: more baby clothes, some pottery, some really nice wooden bowls, preserves, etc. We bought a jar of pickles, a jar of jam, and a date loaf (something like banana bread but without the bananas). Total expenditure: $16, which was probably a good percentage of what would be spent in Tarcutta that day. Definitely not enough business to sustain a village. At the same time as the highway got diverted – and it is only a short jaunt into town from the highway, so this would have worked – the government scuttled plans to build a huge truck stop in Tarcutta. This would have put some more business into town. Not going to happen. No real reason given. But is it sustainable in the long run to base your entire economy on a truck stop? Probably not. The highway bypassed Jugiong a few years ago, but they manage to attract tourists still with a great cafe and a really cool wine shop selling only wines from within about 50 km. And the locals also complain that the new bypass doesn’t have good enough signage and that, for instance, people don’t know that you can get off at that interchange, stop in Tarcutta for lunch, and then go to Wagga. 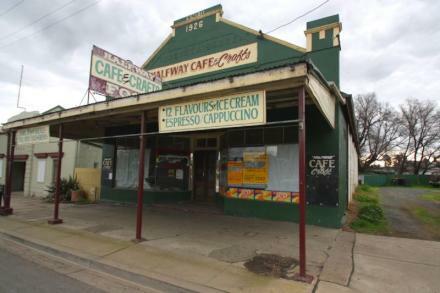 Which actually isn’t that realistic because 1) we’re not sure if the café is still actually open (you could get a pie at the Caltex…) and 2) if you come off the highway there and head to Wagga, you still miss Tarcutta by about a kilometer. But desperate people come up with desperate ideas. But, now for a reality check: the people of Tarcutta have been complaining a lot about how the bypass has devastated their town, but based on our observations they weren’t doing really well before. There were businesses that have obviously been closed for a lot longer than the bypass has been open. The school is closed (at least we hope it was…it looked like it should be condemned). An op shop and a gas station do not make a town. And while the bypass might be what finally kills it, it seemed to already be on its last legs. Building the bypass was more like turning off the machine that is barely keeping someone alive than shooting a healthy person. In fact, we found this blog from 7 years ago where a traveler points out that Tarcutta has been in palliative care for a long time. Overall, not a fun road trip…But though this post is a bit negative, we are sad to see the small regional towns dying. We’ve been to a few of them, and they aren’t thriving. For example, in both Ganmain and Lockhart – which we had fun in, as we point out in previous posts – major businesses are for sale and having a hard time finding buyers. This is a partly the culture that we came here for, to get away from big city life. Hopefully something happens to revive the rural towns. And for now, we will continue to do our share of sustaining their economies, one jar of jam at a time. This entry was posted in driving, market, money, newspapers, road signs, small town culture, Tarcutta, traffic signs, travel. Bookmark the permalink. I called into Tarcutta on Sunday night at about 4.00pm on the way from Sydney to Melborne. Sadly not much has changed. The craft shop is still there. Apart fromm the Caltex and the pub it seemed to be the only thing still open at that time of the day. I think that was only beause the elderly lady on the counter and another man were struggling to reconcile the day’s takings, meagre as they appeared to be. That said, the shop was actually pretty good. It seems to be a sort of community shop selling on behalf of a variety of local suppliers and producers. The range of products is quite interesting, from knitted finger puppets to beautifully created scarves and throws. I spent around $60 which I think increased their turnover for the day by about 50%. I would have spend more but forgot to buy a date loaf and pickles! They were selling their cans of soft drink for $1 too. The shop was just what I was looking for actually as I wanted to buy a variety of gifts for my family and I managed to get something for everyone there. I will call in again if ever I make a return visit to Tarcutta if only to see if anything has changed.